This is the first of a four part article about strategic marketing planning and how to write an effective marketing plan. This articles gives you an introduction on marketing planning as a concept and outlines the overall process. The subsequent parts will talk in details about each phase of the marketing planning process. If you are thinking of opening your own business, or if you already took that step and now own or operate your own small business and want to learn more about how to write one of the key documents for your business, the marketing plan. Keep on reading, this article is for you. Alternatively, if you work in marketing and creating the marketing plan for your company is one of your responsibilities, I think you will find this article very helpful and will provide you good directions for your task. Since the key audience this article is meant for is not marketing graduates or marketing professionals who do marketing on a daily basis, I will try to keep the language very simple and visit the main concepts briefly to give you a better understanding of the overall process. The marketing plan is one of several key documents for your business. These include the business plan, which outlines your business’ overall financial and operational objectives and strategies, and the strategic plan, which discusses your business’ general long term strategic direction. Your marketing plan will not be effective if it does not take into consideration the overall business objectives and strategies and integrates them within the marketing function. The failure to do so, will result in an isolated document that is not very relevant to the business and does not address its core challenges and aspirations. But before I get into the structure or anatomy of the marketing plan, how it should be written, what to include and the overall outcome of the marketing plan, I want to briefly talk about marketing planning as a process, out of which, the marketing plan is the result. “The process of researching and analyzing your market, developing and documenting your marketing objectives, strategies and programs, and implementing, evaluating and controlling marketing activities to achieve your objectives”. Marketing planning as a process, enables you to identify a number of alternative marketing opportunities for your business and evaluate each of these alternatives to reach one or more that will serve your business’ goals and objectives. It also allows you to foresee the different risks that your business may face and assess the level of risk associated with each threat and come up with strategies to minimize those risks and overcome these challenges. The outcome of this marketing planning process is the marketing plan, which is a document that outlines what you, as an organization, have learned about your market, what your objectives and goals are, and how you plan to achieve your marketing objectives. Now that you have an understanding on what marketing planning and a marketing plan is, let’s get into the different components that, put together, constitute the marketing plan. This concludes of the first part of this article. 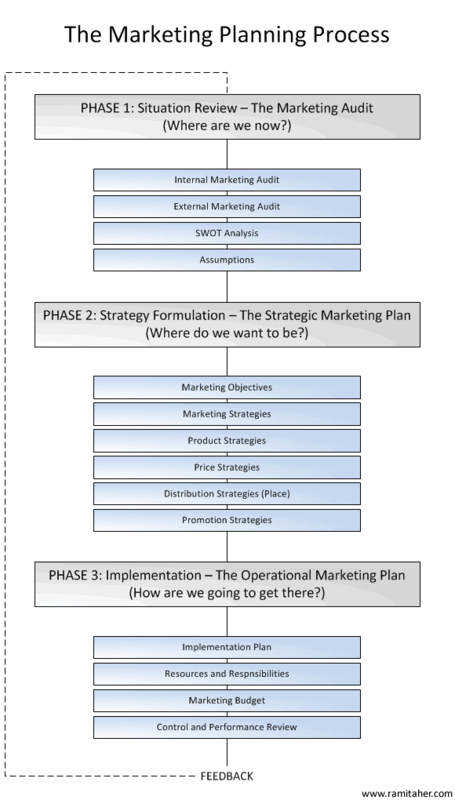 Part 2 of this article, PHASE 1: Situation Review – The Marketing Audit is coming soon, so return soon to get an in-depth review of each phase of the marketing planning process.